Nissan car parts for every Nissan model. Order car parts today and receive FREE NEXT DAY DELIVERY or collect in branch. Extensive range of car parts available for every Nissan model including; brake pads, brake discs, engine oils, car batteries, air filters and much more. 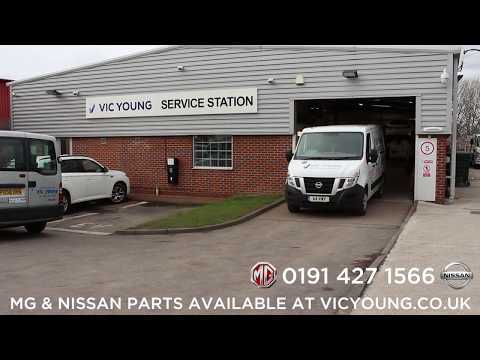 We are an official Nissan approved service centre & body shop based in South Shields, delivering & supplying Nissan car parts to Sunderland, Newcastle, Gateshead, North Shields and surrounding areas for over 40 years. We only stock and sell genuine Nissan car parts. We offer free delivery to trade customers in most areas of North East England. Please call to check if we deliver to your area. Call us now for expert advice & assistance. Barry Jackson (Parts Manager) and Alan Young (Parts Adviser) have both worked at Vic Young in the department together for over 30 years. They have well over 60 years combined experience supplying car parts. Their knowledge, experience and understanding of the car parts industry is second to none. The stability of our management is a key reason so many of our trade customer’s work with us. We are an award-winning car dealership based in South Shields, close by to Sunderland, Gateshead and Newcastle. Our family-run business has been trading for over 40 years and we pride ourselves on our ability to provide best in class service to all our customers across all our main areas of business including; Parts, New/used cars, Motability, Servicing, Accident and repair, MOT, Warranty repairs, Fleet, Vehicle rental and Conversions.